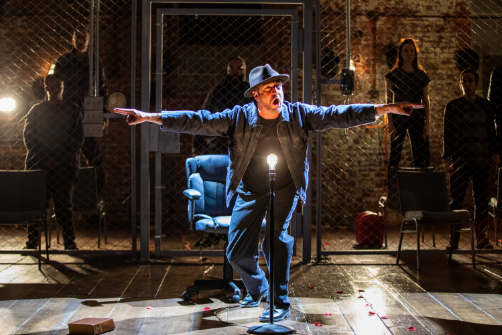 Raúl Esparza in The Resistible Rise of Arturo Ui. Photo by Joan Marcus. BOTTOM LINE: Brecht's modern classic, a vicious indictment of fascism in Nazi Germany, is hilariously and chillingly relevant in John Doyle's economical staging. The plays of Bertolt Brecht are not subtle, but then, neither is fascism. Written in 1941, Brecht’s The Resistible Rise of Arturo Ui is set in Chicago circa the Depression, following the criminal career of a gangster aided and abetted by the city’s establishment; however, its subject is quite clearly Nazi Germany, from which the playwright had fled eight years earlier. The play was intended as a wake-up call for audiences of its day and a dire warning for those of the future. It's also popped up on New York stages several times since 2016. Why? Draw your own conclusions. Arturo Ui was a commercial failure in its two appearances on Broadway (perhaps for being too blatantly pro-Marxist), but is a perennial favorite in smaller, edgier theatres. In Classic Stage Company's intimate downtown space, Artistic Director John Doyle puts his skill with small ensemble casts to work on Brecht's epic text. Doyle's reunited here with NYC theatre stalwart Raúl Esparza (L&O: SVU's Rafael Barba to the rest of America), who starred in his much-lauded revival of Company over a decade ago. One of our oddest and yet most charismatic stage stars, Esparza has spent his career bouncing back and forth between musicals and straight dramas; that experience serves him well here, playing a comical character in a deadly serious context. Doyle has also designed the set for this staging, an anti-theatrical environment in which the cast, a versatile and diverse group, are depicted less as artists than as workers whose trade is building stories rather than laying bricks or hauling junk. They set up and break down the same kind of tables and chairs they’d probably use in the rehearsal room. Ann Hould-Ward’s costumes look as if they came out of the actors’ own closets, save for the occasional bowler hat and widow’s veil. The concept doesn’t work as well in practice as it does in theory; I kept worrying that those tables were going to collapse mid-scene. Thankfully, the lighting design by Jane Cox and Tess James provides the theatrical spark the staging otherwise eschews; the rest is up to the cast, which, par for the course at Classic Stage, is excellent. Standouts in the ensemble include George Abud, who comes close to stealing the show, and Elizabeth A. Davis, chilling as a remorseless killer. Esparza delivers as Ui, an amalgam of Hitler, Al Capone, and Shakespeare’s Richard III with some Macbeth and Mark Antony sprinkled in. Crucially, he nails the neediness and insecurity that underpins the gangster’s violent quest for power and control. As he laments, “Nobody talks about me anymore...Two months without a brawl, and twenty murders all forgotten,” he’s almost lovable. However, as he and his confederates terrorize innocents and double-cross fellow crooks, what seemed picaresque becomes legitimately frightening. It’s too bad that Arturo Ui keeps proving so relevant, but if we must grapple with power-hungry leaders and their greedy enablers over and over again, at least we’ve got Brecht to help us through it. Whether you need some fuel for the fight or just the opportunity to laugh instead of cringing, Classic Stage has you covered for now. Resist! The Resistible Rise of Arturo Ui is by Bertolt Brecht. Translated by George Tabori. Directed by John Doyle. Scenic Design by John Doyle. Costume Design by Ann Hould-Ward. Lighting Design by Jane Cox and Tess James. Sound Design by Matt Stine. Production Stage Manager is Bernita Robinson. The cast is George Abud, Eddie Cooper, Elizabeth A. Davis, Raúl Esparza, Christopher Gurr, Omozé Idehenre, Mahira Kakkar, and Thom Sesma.